New Zealand-based artist and blogger SUIKA recently showcased the piece of art below on his blog, IDC (I Don't Care). What prompted SUIKA to produce this acrylic-on-canvas painting that combines a saucy bit of text and a blown-up sprite taken from that 16-bit classic, Super Mario World? 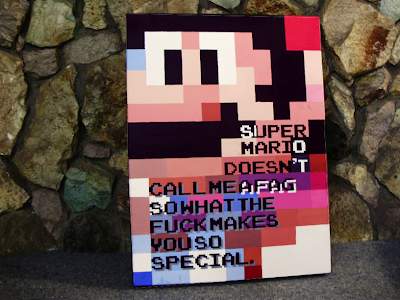 According to the man himself, the piece is "half a response to the question, Why do you like video games so much? Well, Mario's not gonna' complain about the state of the economy, or call me an abomination and tell me who I can't marry or criticize the way I dress. So, how could I not prefer video games to real life?" I love this. What a great effort to merge pop culture with a positive message that packs an emotional wallop. Yes! It really is a well-produced piece, isn't it? You should keep an eye on SUIKA's blog, by the way, as he posts great stuff like this on a pretty regular basis. You're very welcome, Kimimi :) I've favorited a few of his pieces, too. I really like how he's able to juxtapose the videogame imagery with the text in an artful and elegant way. Hey Mr Ochalla! And everybody, thanks for yr comments. I think I'm just too fond of juxtaposing things that don't usually go together, other than in my own head. Or yours. Or any other gay gamer, or anyone who subscribes to a similar label / identity. etc! Thank you guys.